An aptly named male Handsome Meadow Katydid calls from the low vegetation by a wetland. 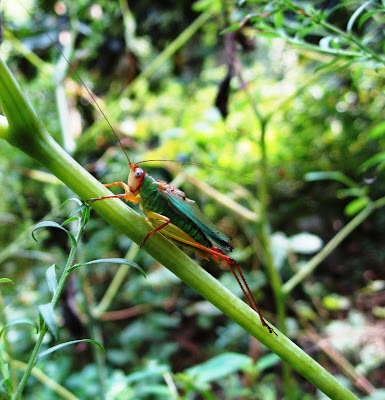 I'd like to introduce you to one of my favorite Orthopterans (the grasshopper, cricket, and katydid family). The Handsome Meadow Katydid (Orchelimum pulchellum) is about one inch long and has some beautiful translucent colors with bluish eyes. It sings in low vegetation and is usually associated with water, calling mostly during the day but also at occasionally at night. The Genus name is Greek for "I dance in the meadow" which I think is quite fetching. The species name simply means "pretty." Again, all the very appropriate. A female Handsome Meadow Katydid shows the large ovipositor used for egg laying. As in most Orthopterans, the males do the "singing" which is actually called stridulation and is achieved by rubbing of their wings. Other Orthopetrans use their legs or combination with wings, while some like the Camel Crickets we find in out basements are wingless and do not call at all . The call of the Handsome Meadow Katydid sounds a bit like a water sprinkler to me. Females choose the best singers and then use their long ovipositors to lay eggs in grass stems. In general, grasshoppers differ from katydids in having short antennae while katydids have long antennae. Crickets tend to have flat backs and are also normally brownish in color. They also have long antennae. These insects together make up the order of insects called Orthopetra. Despite the colorful nature of Handsome Meadow Katydids, they are extremely difficult to see. They can be singing inches from you and still be well concealed. Several times I've been listening to one which had to be right in front of me, only to fail in finding him. When disturbed they will quickly go silent (and those nearby will take the cue and do the same). They have an interesting habit, like many other katydids and grasshoppers, of using the stalk they're sitting on for cover. They will flip to the back side of the stem or stalk and use it for both a physical and visual shield. They can play this game of flipping to the opposite side for quite a while until finally jumping away. A female Handsome Meadow Katydid ovipositing eggs into a stem. The Golden Garden Spider (Argiope aurantia) goes by a variety of common names. The Golden Garden Spider (Argiope aurantia) has numerous common names: Yellow Garden Spider, Golden Argiope, Black-and-yellow Garden Spider, Writing Spider, Zigzag Spider, Signature Spider, Common Garden Spider, Corn Spider, McKinley Spider, Yellow Garden Orbweaver, and Zipper Spider for examples. This large and colorful orb weaving spider is common in fields and sunny gardens where it constructs its large (up 2ft) web low to the ground where they are protected from the wind. The web typically has a reinforced web decoration called a stabilimentum in its center. This web feature gives the spider several of its common names. The purpose of the zigzag webbing has often been debated. When young it is believed to help hide the spider. When older, some believe the web helps to keep large predators such as birds from stumbling into it and destroying the web. Others have theorized and some experiments seem to show that it makes the web attractive to some potential prey. Its favored prey include katydids, grasshoppers, and bees, though there are reports that even small lizards can be caught. The web decoration, called a stabilimentum, gives this spider several of its common names and its function has many theories behind it. The web center is usually consumed each day by the spider and a new center built, while the outside structure tends to remain the same. The orb webs are usually less than three feet off the ground, but can be two feet in diameter. The spider usually hangs head-down in the center of the web with its legs paired up and spread. When threatened, it may shake the web vigorously, sometimes blurring the spiders appearance or making it appear larger and more visible. They may also drop down or hide in the nearby foliage if danger threatens. This is what this Argiope spider looks like from underneath. The head-down position and spread, paired legs is typical for them. Females can be almost two inches long, while the males tend to be much smaller, rarely reaching even 1/4 of an inch in size. The males are also more slender of build and often live or hang out on the outskirts of the female's web. They sometimes even steal food from the females. He needs to be careful however as she may eat him, particularly after mating. Males often have draglines ready and drop off if the female gets too close. Their papery egg sacs are marble-sized and tough, holding up to 1,000 eggs, and are often hidden in the web. If well fed, 3-4 can be produced in one season. The young do not emerge until the following spring (though they normally are born in the Fall), often ballooning with the wind to new nest sites. The females live less than a year, dying by the first frosts. The males usually die right after breeding.